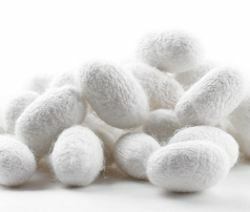 Silk has been called the Queen of Fabrics throughout history. Its origins date back to 2600 BC in China where this fiber’s processing was a closely guarded secret of the imperial family for over 2000 years. Modern manufacturing has helped make this one-time luxury item readily available to the sewist. Shrinkage can occur with either washing or dry cleaning, so add 1/8 yard to each yard you purchase and pre-shrink before cutting. Keep in mind that silk takes dyes very easily and can just as easily discharge them slightly when laundered, so wash separately. Rinse silks with ¼ cup of white vinegar per gallon of water then rinse a second time to remove soap residue and soften the fabric. Dry cleaning can sometimes dull the luster of silk but keeps it crisp. If using a dryer, remove the garment while still damp and either hang dry or press while slightly damp to diminish wrinkles. A press cloth or pressing on the wrong side eliminates shine. Launder all interfacings, trims, etc. as you will be laundering the finished garment. Although chiffon, georgette and other very fine silks can prove a challenge, many silks are as easy to handle as any good cotton or linen, especially when blended with other natural or synthetic fibers. It’s advisable to use the “napped” pattern layout. Lay slippery fabrics on tissue paper and pin the pattern through all layers before cutting with sharp scissors. Keep scissors and rotary blades free of nicks as these can pull threads and damage the silk. Serrated shears are another option for accurate cutting. Mark darts, etc. with non-waxed marking tools or tailor’s tacks. Non-fusible stabilizers, organza, organdy, voile or self fabric are common interfacings. Fusible products aren’t as compatible with most silk, especially the finer ones, as they can bubble and separate with wear and cleaning. However, quality fusible knits can often work well with more substantial silks. Like other natural fibers, silk won’t dull the needle as quickly, but always begin with a new one. A single holed throat plate may also be required to keep thinner silk from bunching in the slot. If you don’t have one, tape over the slot, run the needle through it several times, then through a clean piece of cotton to remove any tape residue. Universal needles are acceptable, but finer silk may require a sharp or microtex needle. You may also need to go down a needle size for less puckering and neater stitches. Cotton-wrapped polyester or polyester threads are recommended for stitching and silk threads for top-stitching and embellishments. Silk thread can actually cut the fabric at stress points so is not recommended for seaming. Stitches should be between 8 and 12 per inch. Raveling can pose a problem. Hand or machine overcast/serge the edges of seams. Seam binding, zig zag or a Hong Kong finish are also options. Press seams as sewn then press open or to one side, depending upon the seam finish. Make sure the right side is smooth. China silk, jacquard or crepe di chine are excellent choices for linings that add beauty and stability to a garment.